In the Hindu tradition, the whole creation is the dynamic game of three fundamental forces symbolized by the three gods: Brahma, Vishnu, and Shiva. 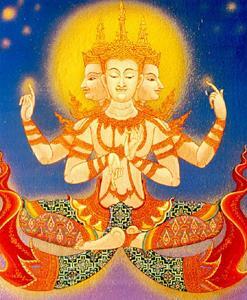 This triad is made up of the creator (Brahma), the sustainer (Vishnu) and the destroyer or transcendent (Shiva). The correspondence of these three principles (creation, sustenance and destruction) in our daily existence is to be found in birth, life, and death. These correspondences occur not only at a physical level, but at psychic level as well. They represent the very basis of the universe, in its continuous becoming. In the Tantric cosmology, these three forces are regarded as three aspects on one and the same divine Unity. Each of these forces is inseparable from its feminine part, or of its Shakti. According to Tantric teachings, any superior principle can exist only as a combination of feminine and masculine. In the previous articles we presented to you the sustenance aspect of God as He appears in the Hindu tradition (Lord Vishnu). Now we will introduce to you the first of the divine aspects – the creator as it is depicted in the Hindu cosmology, as the god Brahma. The path of the human being to spiritual perfection has to be trod with a creative, positive inner attitude. This attitude, named “cosmic optimism”, expresses the dynamism of life and derives from a sublime ideal. It means the recognition and identification of each of us with the fundamental divine energy that created everything. The creative inner attitude offers us the possibility of discovering our true, profound nature, accelerating our spiritual progress. This creative inner attitude is a part of the evolutionary process itself. It may be awakened and amplified through the process of resonance with Brahma’s specific energy. The Hindu tradition perceives the cosmic activity of the Supreme Being (God) as threefold: the creation, the sustenance and the destruction and associate these three activities with the main deities: Brahma, Vishnu, and Shiva. 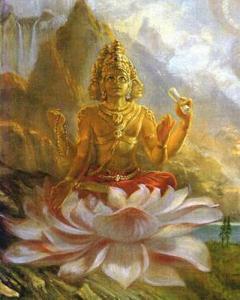 As we already mentioned, Brahma represents the creator aspect of the divine. Vishnu sustains the creation and represents the eternal principle of preservation, and Shiva represents the principle of dissolution, of the destruction of evil, of transcendence. We have to understand that basically, Brahma, Vishnu and Shiva are not three distinct deities, independent from each other, but they represent in fact the same Supreme Force, in its three different aspects. 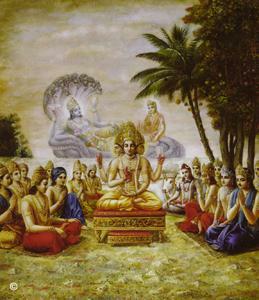 Brahma is the creator of the universe and of all beings. His world is Brahmaloka, containing all the splendors of the earth and all other worlds. 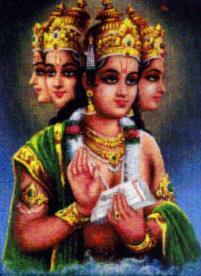 In the Hindu tradition, Brahma’s most common representation is four-headed, four arms, and red skin. He holds a cup, a bow (or in other representations a book of prayers), a spoon and the Veda-s, created and spread by him. He sits in the lotus pose. When he moves around, he has as vehicle a white swan, endowed with magic powers: she may separate soma (divine nectar) and milk from water, as well as good from evil. Unlike all the other gods, Brahma carries no weapon. 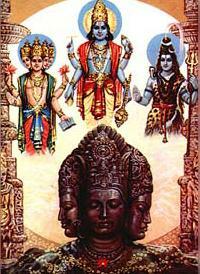 Although Brahma is the equal of Vishnu and Shiva, his popularity is no longer at its peak. According to “Shatapatha Brahman” writing, the creator was born from Brahman, God. Wishing to create the universe Brahman first created the water, in which he placed his seed. This seed transformed into a golden egg, from which Brahma appeared. According to the Purana, Brahma is the Son of God and the feminine energy Maya. Nonetheless, there are other sources sustaining that Maya is Brahma’s daughter or wife. Maya is the symbol of the cosmic illusion, whose veil does not allow mortals to perceive God. Maya has two aspects: Avidya Maya, the ignorance that estranges mortals from God, and enslaves him more and more into the universe of the senses, and Vidya Maya, the liberating knowledge that gradually leads mortals to the ineffable and intoxicating communion with God. The Tantrism promotes the idea that as the Supreme God governs all the destines and all the things in the universe, it is highly important that He is auspicious to us. In order to accomplish this, they yogis have developed a technique of identification with Brahma, which will help us gain the inner attitude that accelerates our spiritual progress. 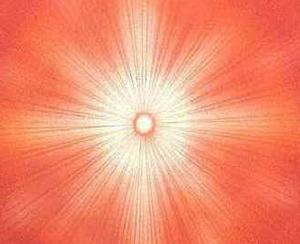 This technique implies that we envisage ourselves wrapped in an aura shaped as an egg, bright yellow in color, emanating positive energy. We have to visualize as clearly as possible the warm rays of bright light and force emanating from our aura, nurturing and sustaining our life and our relationships with other people. It is advisable that we assign this exercise 10-15 minutes daily. We will note the gradual improvement in various domains of our lives. “Saraswati, Brahma’s feminine counterpart radiates more than the light of ten billions moons. Her ornaments are purified in the heavenly fire. She is the mother of the Veda-s, the embodiment of nature and the patron of the arts and sciences. Saraswati is always smiling and her beauty surpasses all imagination. Brahma’s feminine counterpart, Saraswati is the goddess governing wisdom and sciences. The Sanskrit term “sara” means “essence” and “swa” means “self”, consequently the translation for Saraswati is the essence of the self. 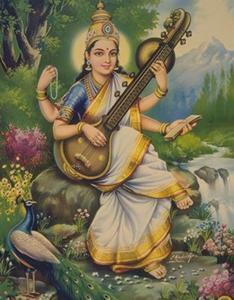 Saraswati symbolizes Brahma’s creative force. All those seeking knowledge, mainly teachers, professors, scientists, students, worship the goddess Saraswati. She is very beautiful, gracious and young. 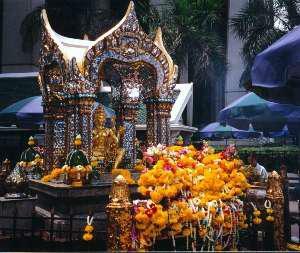 Saraswati is also the master of the 64 arts, of which the art of love is the first and most important. 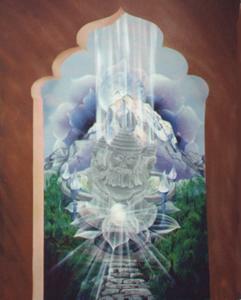 Her representation is that of a woman with four arms, dressed in a white sari, sitting on a white lotus flower. The swan that accompanies her is also white, the color of peace. As the patron of arts, she sings at the instrument called vina. In her right hands she holds a book made of palm leaves, and a lotus, symbol of using the knowledge with love and kindness in order to ensure the prosperity of mankind. In her left hands she wears a necklace of pearls, symbolizing meditation and contemplation, as well as the path leading to samadhi, the total experience of God. Her four arms stand for her omnipresence and omnipotence. The front arms reflect her presence and action in the physical world, and her back arms her active presence in the spiritual world. The Hindu tradition sustains that the universe exists for one day of Brahma (kalpa). At the end of this day (lasting, by human measurements for four billions years) the whole universe is dissolved. At his point, Brahma rests for one night, just as long as the day. This process, named pralaya, repeats for such 100 years, period that represents Brahma’s lifespan. After Brahma’s “death”, it is necessary that another 100 of his years pass until he is reborn and the whole creation begins anew. Manvantara is Manu’s cycle, the one who gives birth and govern human race. Each Manvantara has four divisions, four eras or Yuga-s, each presenting a gradual decline of the spiritual values, in favor of a material progress. A time of “sunrise” precedes each of these Yuga-s, and they end in a period of twilight. These four cosmic eras, or Yuga-s, whose duration is in “divine” years are: Satya Yuga (1.728.000 human years), Treta Yuga (1.296.000 human years), Dvapara Yuga (864.000 human years), and Kali Yuga (432.000 human years). The duration of the four Yuga-s is consequently 4.320.000 human years or 12.000 divine years. Satya Yuga is the ideal period, in which hatred, envy, suffering, fear, and threat do not exist. This is the time of maximum bloom of human spirituality, in which the noble feelings of love, aspiration, happiness are present everywhere. Treta Yuga presents the appearance of sacrifices, a whole set of rites and ceremony is necessary. The spirit of justice diminishes, and people act to their own interest, expecting rewards for their good deeds and for the manifestations of their cult. Dvapara Yuga witnesses the decrease of the spirit of justice to even a greater degree, so that only few people will seek the observance of truth. The rites that exist now will lead people both to the good and to the bad. Also, diseases and inferior desires come up at this time. In Sanskrit, Kali Yuga is the era of maximum spiritual decadence, of ignorance, darkness, materialism, conflicts, misunderstandings and violence. The spirit of justice is reduced to minimum during this age. Spiritual aspirations, and spiritual and scientific ancient knowledge are forgotten, and the evil is almost all-pervading. The human beings are subject to all kinds of diseases, hatred, starvation and fear. This is the age we live in at the moment. 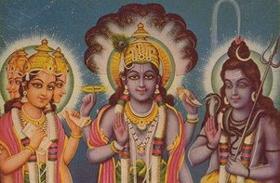 In India there is a legend about Brahma, Vishnu and Shiva. Each of them was boasting about their miraculous powers. All of a sudden, a young boy came forth, asking Brahma: “What do you create?” Brahma’s answer was quick and proud:“Everything”. Asking the other two gods, the boy got the answers: “We sustain and then dissolve everything”. The young visitor was holding a small straw in his hand. Showing it to Brahma, the boy asked: “Can you create a straw just like this?” after an extraordinary effort, Brahma admitted that he cannot create such a straw. The child turned to Vishnu and asked him to preserve the form of the straw. To his amazement, Vishnu was looking helpless to the dissolving form of the straw. Finally, the child asked Shiva to destroy the straw. Despite all his efforts, the straw was still there. Then the boy turned again towards Brahma and asked him: “Are you my creator?” Brahma thought thoroughly, but he could not remember creating the amazing boy. The child suddenly disappeared from their bewildered eyes, and the three gods remembered that behind their amazing powers there is always God.